Deciding which are the best performing wastewater treatment plants can be complicated, as their operations comprise different parameters which are either dependent or non-dependent on each other, and are important when deciding the type of treatment. The relative importance of these parameters in terms of weight indicates the priority assigned by decision-makers to the criteria when ranking the alternatives. These weights are calculated by statistical relativity and Saaty’s nine point scale. The sensitivity of both of these approaches is analyzed. The performance of six municipal wastewater treatment plants is evaluated using the Multi-criteria Decision Making (MCDM) Technique for Order of Preference by Similarity to Ideal Solution (TOPSIS). Efficiency is monitored on the basis of nine wastewater characteristics and compared with the limits established by the Central Pollution Control Board of India. The analysis uses both qualitative and quantitative approaches, which result in differential rankings; accordingly, plants with maximum organic loading removal efficiency were found to be most efficient when weights were applied as per Saaty’s scale. The study proposes a field base approach with regard to the suitability of the weight allocation method for respective utilization of the fuzzy approach in environmental monitoring systems. A typical wastewater treatment operation mainly deals with the removal of all forms of solids, foul-smelling gases and bacterial presence. The continuous operation of such plants is monitored through their inlet and outlet characteristics after every succeeding unit so that the performance of each unit can be evaluated. Performance evaluation of a wastewater treatment plant (WWTP) is difficult because of the fluctuations in inlet characteristics due to floating populations and changing lifestyles; seasonal variations, which may include the intrusion of storm water in monsoon seasons; temporal changes; and non-uniformity in the sampling and characterization process. The performance evaluation process mainly involves taking decisions on the basis of these characteristics as the criteria. Finding an optimal solution becomes complicated when the criteria are more numerous (Christian et al., 2008). According to Han and Song (2011), the principles of a performance evaluation index system design mean that it must be scientific and applicable; hierarchical and comprehensive; operable and comparable; and evidence-based and verifiable (Han & Song, 2011). Mechanically, the performance of wastewater treatment plants is evaluated on the basis of the influent and effluent characteristics (Mines et al., 2006; Kumar et al., 2010; Baghapour et al., 2013; Tripathi & Singal, 2013). Efficiency can be calculated after every stage of treatment (Gallego et al., 2008; Han & Song, 2011; Khambete, 2013; Khambete & Christian, 2014). When multiple outcomes are governed by multiple input parameters, analysis with logical tools would be the best approach. In recent years, attempts have been made to evaluate performance using the fuzzy logic approach based on artificial neural networks, and multi-criteria decision making tools, amongst other approaches (Ráduly et al., 2007; Han & Song, 2011; Nasr et al., 2012; Vít?z et al., 2012). Mohammed (2006) and Alzboon and Al-Ananzeh (2008) evaluated efficiency on the basis of the removal of biological oxygen demand (BOD) at influent and discharge levels, which was found to be satisfactory (Mohammed, 2006). In 2008 Alzboon conducted characterization of wastewater, evaluating it in terms of measured Dissolved Oxygen (DO), Chemical Oxygen Demand (COD), BOD, solids and Ammonia Nitrogen (NH4) in the influent and effluent wastewater from four selected plants in Jordan. The quality of the treated wastewater was matched with Jordanian standards (Alzboon & Al-Ananzeh, 2008). Kumar et al. (2010) evaluated the performance of a sewage treatment plant operating by the biological treatment method. Mines et al. (2006) surveyed twenty-four WWTPs in Georgia and assessed their performance on the basis of influent and effluent Biochemical Oxygen Demand (BOD5), Total Suspended Solids (TSS), ammonia nitrogen (NH3-N), and Total Phosphorus (TP). Time series plots were generated to show wastewater treatment as a function of the type of treatment technology and temperature; (Mines et al., 2006). Sánchez et al. (2007) compared four plants using different technologies; plant efficiency (E) was evaluated after 19 months of monitoring inlet and outlet TSS, ammonia, COD and BOD5. The correlation between these parameters was studied and an empirical logarithmic relation was found from the experimental data (Sánchez et al., 2007). Gallego et al. (2008) divided WWTP in four sub-systems: pretreatment and primary treatment; secondary treatment; transport; and sludge use. Accordingly, a detailed assessment was carried out on the basis of electricity and chemical consumption, sludge and other waste generated in the WWTP, and the type of technologies used for secondary treatment (Gallego et al., 2008). Overall, the attempts to evaluate the performance of municipal wastewater treatment plants have neglected the seasonal variations in influent characteristics, the principle mechanisms of the plant, and the varying flow rates. These limitations have been overcome in recent studies by applying the fuzzy logic approach. This is a complex mathematical method that allows the solving of difficult simulated problems with many inputs and output variables (Zadeh, 1988; Novak & Lehmke, 2006; Malekinezhad, 2014). Sudasinghe et al. (2011) carried out performance evaluation on the basis of 109 performance criteria using clusterization. The combined scores for performance were described using linguistic variables. Overall performance was ascertained by proportioning the number of better performing criteria to the total number of criteria tested (Sudasinghe et al., 2011). Ráduly et al. (2007) evaluated the performance of wastewater treatment plants using the artificial neural network (ANN) approach; an influent disturbance generator was combined with a mechanistic WWTP model, which helped to develop a limited sequence of training data collected over four months. An ANN model, calibrated using the available WWTP data and influent time series over twenty years, was generated. Results were obtained at an acceptable level, in accordance with the urban context, with errors of less than 10% (Ráduly et al., 2007). Nasr et al. (2012) also evaluated performance using an artificial neural network. His study provided results with an R value of 0.90, indicating an acceptable correlation between the observed and predicted output variables (Nasr et al., 2012). When the probabilities of the outcomes are unknown, decisions are made under uncertainties, which is the prime domain of fuzzy decision making. Fuzzy multi-criteria decision making is concerned with structuring and solving decisions and planning problems involving multiple criteria. The characterization of wastewater involves different parameters, which are dependent or non-dependent on each other; but are more important when deciding treatment. This makes it difficult to make decisions on optimally performing treatment plants. Multi-criteria decision making (MCDM) is a discipline of operational research, in which multiple criteria are involved in decision-making environments in order to reach optimal solutions. 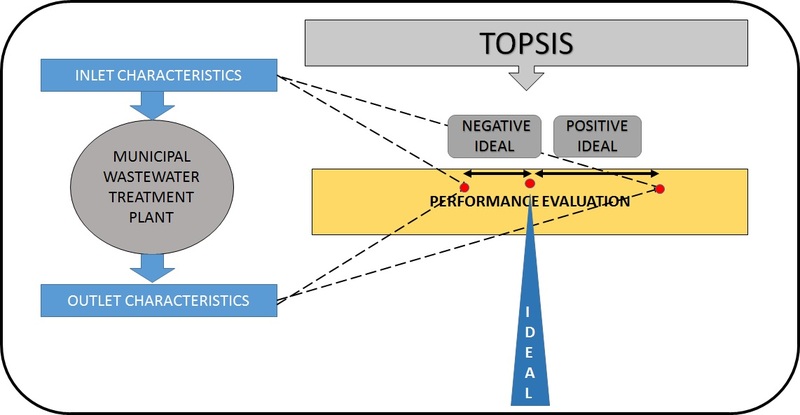 The Technique for Order of Preference by Similarity to Ideal Solution (TOPSIS) is a decision-making tool which is based on calculating the geometric distance between each alternative and ideal alternative within each criterion (Wang & Elhag, 2006; Shi et al., 2010.; Antucheviciene et al., 2010; Nezhad et al., 2015) Wastewater treatment plant operations are subject to different criteria and as they should be compared with discharge standards, this indicates that evaluation with TOPSIS is feasible. Fuzzy TOPSIS is a method of compensatory aggregation. This approach allows affairs within criteria to nullify a poor result of one criterion with a good result of another. This provides a more realistic form of modelling than non-compensatory methods, which include or exclude alternative solutions based on strict limits (Zavadskas et al., 2006). Weight or relative importance of a criterion indicates the priority which a decision-maker assigns to it while ranking the alternatives (Loucks et al., 2005). In this study, performance evaluation of municipal wastewater treatment using fuzzy multi- criteria decision making has been conducted on six major treatment plants in India. Although several evaluation approaches are available, they are tend to be based on insufficient assessment carried out by referring inadequate datasets; neglecting the overall adverse effects on the environment (Puig et al., 2008; Puig et al., 2010). In the fuzzy approach, the relative importance of the evaluation criteria need to be adopted by considering all the dependent parameters. The weights of the variables could be allotted either by statistical correlation or by considering expert opinion. The statistical approach is a merely mechanical one, with the essence of mathematical relativity, without considering the realistic loading removal trends which occur due to the seasonal variations in wastewater flow and the treatment mechanisms at the wastewater treatment plants. When weights were allocated on the basis of Saaty’s scale, the results found were acceptable, as they were the combination of qualitative and quantitative evaluations of the wastewater. In the case of municipal wastewater treatment plants, the activated sludge process and extended aeration are the most commonly adopted principle mechanisms. In such circumstances, it is difficult to rank the plants, as their capacity and working approaches are different. The conventional input-output based efficiency audit fails due to uncertainty. The statistical approach to efficiency calculation is entirely qualitative, whereas the fuzzy approach provides qualitative as well as quantitative evaluation. The relative importance of each parameter is expressed in terms of weight. Application of weights to the criteria needs to be governed realistically. Thus when weights were applied mechanically by means of a mathematical tool, it was found that apart from typical performance indicators such as BOD and COD, the results were unacceptable and contradicted the field conditions. In the other approach, in which the weights were applied on the basis of Saaty’s nine-point scale, the rankings were found to be realistic and matched their BOD and COD removal efficiency. Consequently, WWTP2, with a score of 0.455, was ranked 1, indicating the highest efficiency, whereas WWTP4, with a score of 0.649, was ranked 6 when assessed on the basis of CPCB limits. The statistical approach is acceptable in terms of having less calculus and limited constraints. Certain parameters, such as infrastructure cost, land investment, power consumption and maintenance, could be applied at the end of the decision process.